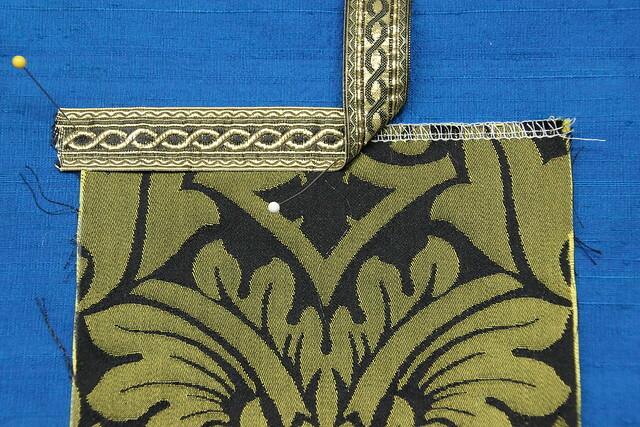 Tonight we will take a short look at applying galloon trim to an orphrey band. The orphrey bands are being placed on a pastoral stole. We have been looking at stoles for a while, but there is so much ground to cover when it comes to making a stole. Many of these tips and techniques can help give a stole that polished professional look when completed. But no need to worry. 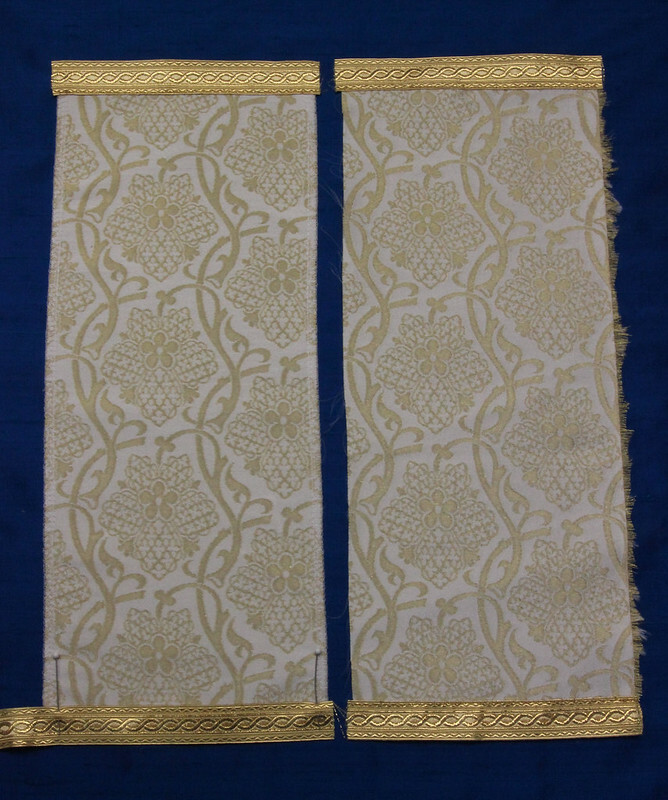 Making stoles is a process, as are all Ecclesiastical Sewing Projects. It takes time, patience, a bit of looking back and reflecting, and practice to progress in stole making skills. So for today, let’s look at a little tip that will help you stoles not only look nice and more professional, but it may also save a bit of time in the construction process as well. 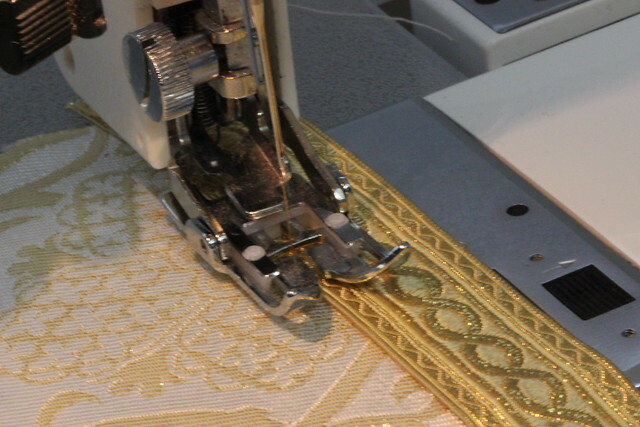 If you flip through the pages of some of the Ecclesiastical Vestment catalogs, you may notice pre-made orphrey bands that already have the the galloon braid applied to the base fabric. These pre-made orphrey trims can get rather pricey in a big hurry. But let’s take a hint from the way these pre-made bands are constructed, and pre-make orphrey bands prior to applying them to the stole fabric. 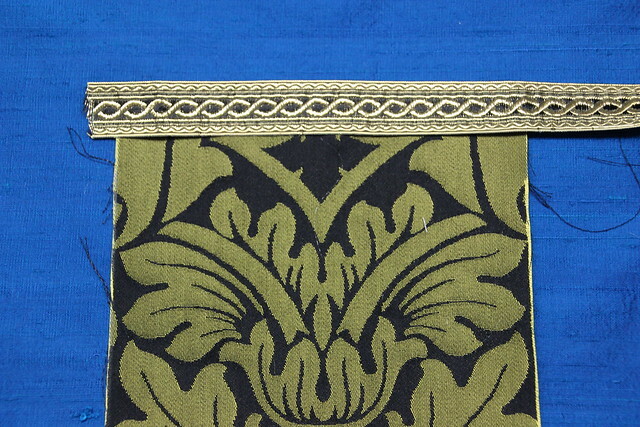 In a previous post on Orphrey bands, we were using the Black/Gold Fairford fabric with the St. Benet Galloon in Black/gold. The galloon is positioned about halfway along the edge of the fabric and pinned in place. The fabric and trim are ready for stitching once everything is lined up. The trick is to position the galloon so that the surged edge of the fabric is at least half way up on the trim. If one places it too far up, it may stick out on the upper edge. If it is not positioned far enough, the risk of having the fabric fray increases. This is Gold St. Benet with the Ivory/Gold St. Hubert Galloon. You may notice that the sewing machine is set up with an even feed foot. I like to use this when sewing Church Vestments so that both layers of fabrics feed evenly through the machine to avoid any puckering that may result from the fabrics not feeding evenly. The needle is placed close to the edge of the galloon, and started in about 1/4″ from the edge. I back-stitch to the edge, and the stitch to the opposite end, where I back-stitch again 1/4″ and remove the fabric. The process is continued on the opposite edge of the orphrey. This final step may seem to be so basic, you may wonder why I mention it at all, but if this step is missed, the end result becomes a glaring eye sore that can mare an otherwise lovely project. 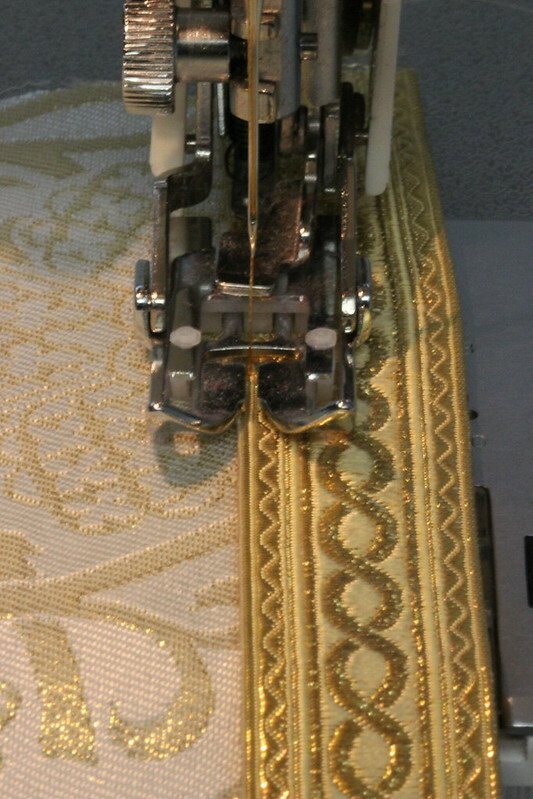 Once three pieces of galloon are sewn in place, measure and check the position and placement for the fourth piece of galloon, making sure it is even with the trims on the completed band. If a longer length of orphrey band is being created, follow the same steps. But, also be sure to keep you stitching perfectly straight. You may also consider the options of basting the galloon to the orphrey prior stitching by machine. Some people like to use a light spray adhesive ( not my personal favorite, but I do use this method). So why stitch orphrey bands in this order? One could certainly stitch the orphrey fabric in place, and then go back and add the galloon. I have done this myself. And, the project looked fantastic while it was on my sewing table. But that feeling of the project looking fantastic only lasted until the items were hung in church. When I looked at the finished project, I was mortified. Oh, yes, everyone at church sang its praises, but I knew that all was not well. Those puckers were the end result of 6 rows of stitches being used to apply orphrey bands and galloon trim. When those same types of orphrey bands are created and applied today, having some of the work pre-made before applying to the base fabric, and with the addition of a walking or even feed foot, the puckers dare not show. Here is to wishing you all pucker-free orphrey bands.